Use with BIOMYC-2 Antibiotic Solution. BIOMYC™-1 Antibiotic Solution is a treatment based on the antibiotic Tiamutin. 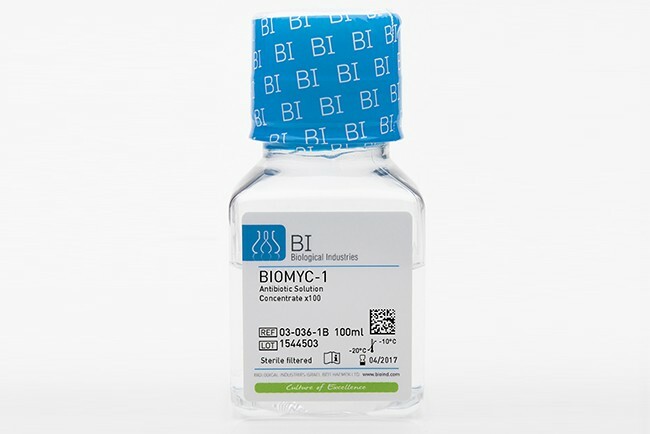 BIOMYC-1 when used with BIOMYC-2, a treatment solution based on the antibiotic Minocycline, which is a member of the Tetracycline group, has been shown to be effective in eliminating the mycoplasma species frequently present in contaminated cell cultures. Mycoplasmas do not develop resistance to these antibiotics – a common occurrence with other antibiotic treatment methods. This treatment is based on alternating BIOMYC-1 and BIOMYC-2. Tip: Four days with BIOMYC-1 (Tiamutin) followed by three days with BIOMYC-2 (Minocycline) then repeating the cycle three times. Do not use the two solutions together, but rather sequentially. Add 1ml BIOMYC-1 to 100ml medium, and maintain the contaminated cells in this mixture for 4 days. Any fresh medium added should also contain BIOMYC-1. After 4 days, add 1ml BIOMYC-2 to 100ml fresh medium, and maintain the cells in this second mixture for 3 days. The above, together, are considered as one treatment cycle. It may be necessary to repeat this cycle 2-3 times. During the process, the cells can be tested for mycoplasma contamination, and results can then be used to shorten the process when possible. Please note: On completion of the treatment, the cells should be grown on media without antibiotics for at least two weeks and then re-tested for the presence of mycoplasma. If the culture tests positive, the course of treatment should be repeated. Certificates of Analysis (COA's) describe quality control data for specific product lots. Please enter the product lot number and click search.